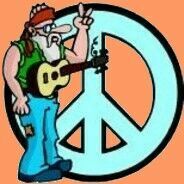 Aging hippies from the sixties cannot get enough protesting as they fight to maintain their anti-establishment credibility. Many of these folks, now over the trusting age of 30, are in positions of power or as they would have said decades ago, part of the establishment. Their righteous tactics to stop a war has turned into a methodology to gain more power and intimidate their targets. 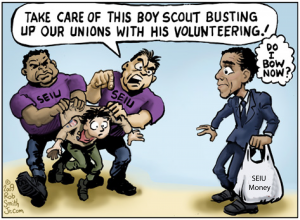 No group may be worse that Obama’s friends at the Service Employees International Union (“SEIU”). 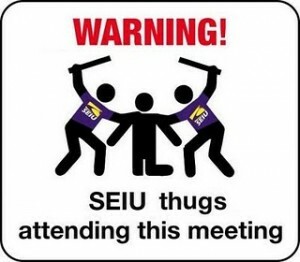 No longer limited to protesting at corporate offices and shareholder meetings, SEIU thugs (I should use the term stupid thugs) have shown up at peaceful tea party demonstrations. In a recent incedent in St. Louis SEIU members (they were wearing their union t-shirts) assaulted a conservative tea party member. You probably didn’t hear about this on the main stream networks even though the conservative was black and the union members were white. That story so fits the lame stream media narrative of a group of white thugs beat up a black man. Where was the outrage? Where were Los Dos Revs (Sharpton and Jackson)? Unfortunately for Mr. Gladney he is a conservative so it must not count to the media. The SEIU must represent poultry operators as they have developed a fondness for eggs. It’s not that they eat them, they like throwing them at their political opponents. Egg projectiles were used against the National Union of Healthcare Workers as they attempted to attend a meeting in Los Angeles. And again were used against the Tea Party Express as they traveled in Nevada. Unfortunately for the thugsAndrew Breitbart was on hand and videotaped their actions. Why are these liberal thugs wasting food when there are so many hungry people in the world? What if someone gets salmonella from the eggs? Besides eggs and beatings, the SEIU members now feel inclined to show up at executives homes to intimidate them and their families as happened recently near Washington. SEIU members, escorted by D.C. police, arrived at a Bank of America executives home with bull horns and signs. It was a Sunday and Mr. Baer was not home, but his fourteen year old son was and he panicked and locked himself in the bathroom. The SEIU thugs actually tried to block Mr. Baer from rescuing his son. Nice folks. This is bullying on steroids. These are Obama’s friends and yet he does nothing to make them stop. This must be what “community organizing” means. Obama and the Democrats are richly rewarded by SEIU with hundreds of millions of dollars in campaign contributions. Where does the money come from? Do a web search using “SEIU campaign contributions” and read the interesting array of articles. I am waiting for school bus load of SEIU members to try to intimidate some executive in some large southern state where trespassing and threatening a person at his home is considered a crime and the executive can defend himself. I don’t think they’ll show up there. They are thugs, but probably not that dumb. One thing that I know about bullies is that they tend to back down when you smash their noses. I am not suggesting violence. I am waiting for someone to hit them in the pocketbook. Why doesn’t someone sue sue SEIU? This article was published on May 25, 2010 . It is tagged breitbart, community organizing, contributions, eggs, hippies, Liberal, outrage, protest, seiu, sue sue seiu, thugs. You can follow any responses to this article through the comment RSS feed.